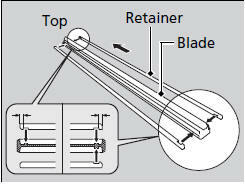 If the wiper blade rubber has deteriorated, it will leave streaks and the metal wiper arm may scratch the window glass. 1. Lift the driver side wiper arm first, then the passenger side. 2. Place a cloth on the edge of the lock tab. Push the lock tab up with a flat-tip screw driver. 3. Slide the blade from the wiper arm. 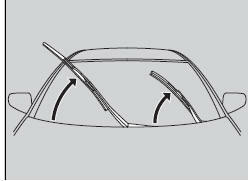 Avoid dropping the wiper arm; it may damage the windshield. 4. 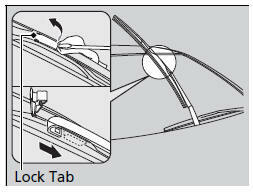 Slide the wiper blade out from its holder by pulling the tabbed end out. 5. 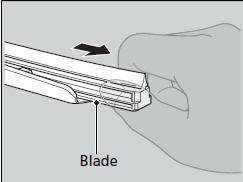 Remove the retainers from the rubber blade that has been removed, and mount to a new rubber blade. - Correctly align the rubber protrusion and the retainer grooves. 6. Slide the new wiper blade onto the holder from the bottom end. 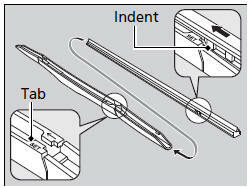 - The tab on the holder should fit in the indent of the wiper blade. 7. Slide the wiper blade onto the wiper arm, then push down the lock tab. 8. Lower the passenger side wiper arm first, then the driver side.